Who is Lancelot du Lac, King Arthur’s most prominent knight and the one with the most enduring popularity? As Dominique Boutet notes, the pre-Arthurian origins of Sir Lancelot remain a mystery. He cannot be traced to the “Matter of Britain,” as he is absent not only in Welsh mythology, but also in the works of Geoffrey of Monmouth and Wace. Making an abrupt entrée in Chrétien de Troyes’ Le Chevalier de la charette at the end of the twelfth century, Sir Lancelot quickly emerges as the preeminent and most popular of King Arthur’s Knights of the Round Table. While some unpersuasive theories have been offered in the past for the pre-Arthurian origins the perfect knight, this talk suggests that the original inspiration for Lancelot appears to be none other than the King-Knight Ladislaus I of Hungary (1077-1095), leader-elect of the First Crusade and sainted monarch of the Árpádian dynasty. One driver behind László’s appearance in French romances has to do with the unprecedented connections between the Hungarian royal court and the County of Champagne in the twelfth century that ultimately resulted in the marriage between King Béla III of Hungary (1172-1196) and Margaret of Champagne, sister of Chrétien’s patron, Marie de France. Another driver was King Béla’s ambition to promote the cult and canonization of his grandfather in order to shore up his own claims to the throne of Hungary. A large body of textual evidence in Romance –language documents reveals that the name “Lancelot” was actually an attempt to reproduce the foreign-sounding name “László” – rather than a substitute for the name as has long been supposed. 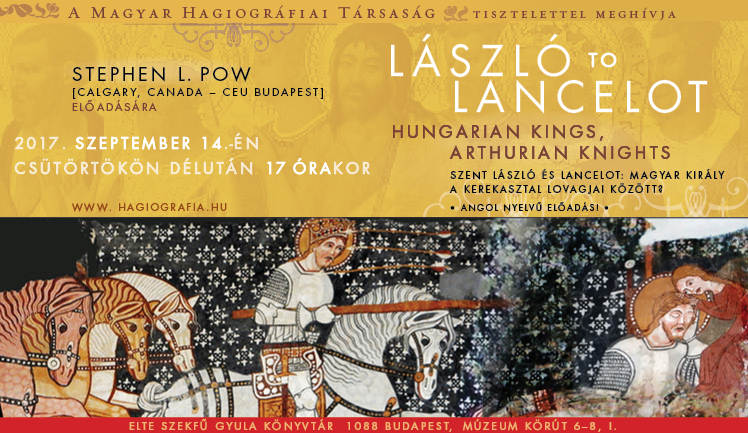 The earliest two romances which feature Lancelot – The Knight of the Cart and Ulrich von Zatzikhoven’s Lanzelet show evidence that the narratives were directly inspired by the historical events pertaining to King László, and a precedent can be shown for medieval romancers of the period to include Hungarian historical figures into their narratives. Chrétien de Troyes’ commission to write a romance featuring the Hungarian king might well have been related to the marriage of Margaret of Champagne and Béla III in 1186. This hypothesis supports Claude Luttrell’s proposed dating for Chrétien’s works, while also showing the subtle and fascinating ways that the political agendas of the period are reflected in Arthurian romances. Egy jó barátomtól kaptam meg ezt az előadásról szóló értesítést, amin sajnos nem tudok részt venni. Örültem ennek, mert a középkori történelemmel én is foglalkoztam a tavaly kiadott „Őseink hite, hitünk ősei” című könyvemben. mégpedig,hogy Chrétien de Troyes talán Marie de France-tól kapta a megbízást egy magyar király történetével kapcsolatban és erre lehetséges, hogy Margaret of Champagne [sic.] és III. Béla magyar király 1186-os házassága ösztönözte. Ezzel az időszakkal, és a történetnek a magyarokkal való kapcsolatba hozásáról már több különböző elméletet olvastam. Számomra ezek közül eddig a legkézenfekvőbb éppen Arthur király és Atilla párhuzamba állítása lenne, azonban ezt sem lehet bizonyítani, mint ahogy nagy valószínűséggel ezt a Lancelot = László elméletet sem. Bár a Lancelot kiejtése : Lá(n)szló, így igen csak kísért a feltételezésben. Mint tudott III. Béla 1. felesége Chatillon Ágnes volt, akinek az apja keresztes lovag volt, az anyja pedig jeruzsálemi hercegnő. Az ő keresztneve azonban Ágnes, vagy más helyeken Anna, tehát itt nem erről van szó. III. Béla 2. felesége valóban Margit volt, de az ő neve viszont Capet Margit , aki valóban VII. Lajos francia király lánya volt. Tehát itt az írásban egy kicsit összekeveredik Mária és Margit személye, pontosabban a neve ! Kár, hogy nem lehetek ott ezen a minden tekintetben tartalmasnak ígérkező előadáson, mert ott bizonnyal azt is tapasztalhatnám, hogy ezek a fent leírt kisebb hibák már nem hangoznak el, és így ez csak valóban e rövid összefoglaló hibája volt.